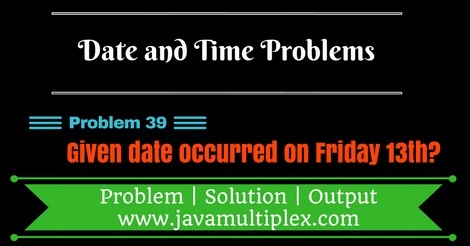 How to check whether given date occurred on Friday 13th in Java? Home Date Interview Questions Medium Date Questions How to check whether given date occurred on Friday 13th in Java? Write a program in Java that checks whether given date occurred on Friday 13th or not? Given date occurred on Friday 13th? In this problem we need to check day name and day number (in month) of given date. Day name should be Friday and day number should be 13. The solution is very simple and straightforward. With the help of DAY_OF_WEEK and DAY_OF_MONTH constants of Calendar class that is present in java.util. * package we can easily solve this problem. How to get every information about current date? * @problem How to check whether given date occured on 13th Friday? 1) How to check whether given date occurred on Sunday Xth in Java? 2) How to check whether given date occurred on Monday Xth in Java? 3) How to check whether given date occurred on Tuesday Xth in Java? 4) How to check whether given date occurred on Wednesday Xth in Java? 5) How to check whether given date occurred on Thursday Xth in Java? 6) How to check whether given date occurred on Saturday Xth in Java? Tags : Date and Time Problems, DateFormat, SimpleDateFormat, String, Calendar, if else statement.